Waters Retail Group is pleased to announce the addition of summer intern Eric Alesius! Over the summer Eric will serve as a marketing intern; assisting in the creation of various print and online marketing campaigns for the property management, commercial leasing, and business development teams. A native of Chester County, Pennsylvania, Eric is a Downingtown West High School graduate who recently finished his Junior year at Penn State University majoring in marketing with a focus in retail and merchandising. A midfielder/defender in soccer, Alesius played as a freshman and sophomore at Penn State Altoona, before transferring to Penn State’s University Park campus in the fall of his junior year. Throughout his time at Penn State, Eric has been involved in numerous clubs including, Student-Athlete Advisory Council, Penn State Marketing Association, Sports Business Club, and Penn State Dance Marathon (THON). Alesius is very excited to work with a team of highly respected professionals and absorb as much knowledge about the commercial real estate industry as he can. While interning, he hopes to improve his skills with various Adobe Suite applications, including Illustrator, InDesign, and Acrobat. Eric is eager to fully immerse himself into Waters Retail Group and hopes his creative contributions can help build upon their current marketing strategies. Waters Retail Group is a commercial real estate development, management, leasing, and brokerage firm located in Southeast, Pennsylvania. 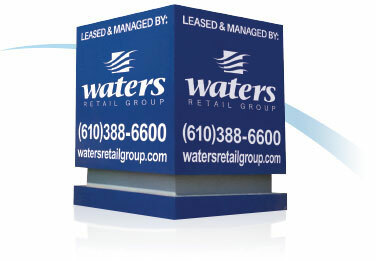 Waters Retail Group manages and leases 25 neighborhood shopping centers throughout Pennsylvania, Delaware, and Virginia. Collectively, we manage over 2.8 million sq. feet of retail space, catering to the needs of over 385 tenants.